#INTUS: 10%+ of Europe's peak generation capacity should be interconnected with the US. To smooth demand, share PV, and catch the Atlantic weather fronts! As of 2015 the EU was driving members to cover ~10% of peak electricity demand with interconnection capacity. The motivation is to help reduce fuel and reserve costs and improve reliability, and also to provide better geographic diversity of intermittent renewables such as wind and sun. This supergrid should extend beyond the EU itself and wider Europe, to the south, the east, and over the Atlantic to the west. WIRED Energy 2017: "A wind farm the size of India in the Atlantic could power the world"
The EU is small enough geographically that on the east-west axis it does not much (for solar PV) spread out sunrise/sunset and time-driven demand peaks. Nor does it always escape from under one weather system for wind, thus increasing demand for storage and demand-callable thermal plant, eg gas. One avenue for improvement is to link eastwards to Russia's 8-timezone E-W span IPS/UPS. Especially if it were to also string lots of PV and wind along a much-reinforced grid. Politically and technically that doesn't seem likely right now. Interconnecting IPS/UPS and ENTSO-E would span 13 timezones. Running south, closer to or even across the equator to reduce seasonal effects, would be good too. But DESERTEC and similar seem unlikely for primarily political/stability reasons for the near future. A bold leap, especially once on both sides there is enough intermittent generation to be hard to absorb locally, would be a transatlantic interconnection EU via Iceland and Greenland to Canada (also see Let’s Build a Global Power Grid: With a little DC wizardry and a lot of cash, we could swap power across continents and Global Renewable Energy Grid Project: Integrating Renewables via HVDC and Centralized Storage), or otherwise between Europe and North America (3300km Ireland to Newfoundland, 5000km England to New England, 5400km from Portugal to New York State), thus gaining 5h+ of solar/timezone difference and different weather as well as hydro and skewed local peak demand times. Indeed, for the really ambitious, floating windfarms could be strung out along the interconnector to inject power into from weather systems across the Atlantic itself (and the jetstream), for further smoothing of supply... These sort of distances are being covered by HVDC projects in China (2090km) and Brazil. With potential losses around 15% (~3.5% per 1000km) may be better than storage efficiency (typical 20--25% round-trip losses for pumped hydro) in terms of grid balancing. Starting from the 2002 EU goal of each country to have ~10% of capacity as interconnection, 10% of US/EU generation would imply something like 70--100GW of interconnection, which is basically bigger than the grid capacity of any of the countries on the EU western seaboard, so would likely have to be spread out over them, eg Ireland/UK, Spain, Portugal, France, possibly even some via Iceland. And any build would presumably be incremental, with intra-US and intra-EU transmission reinforcement and renewables build-out. Why INTUS? ELEXON refers to the various interconnectors to the GB grid, in (for example) the FUELINST dataset, with the prefix INT. 2017/08/24: it is not clear if Brexit would make INTUS significantly harder to achieve. If the UK somehow remains in the European Energy Union then possibly not. 2017/12/13: Renewable interconnectors to “span the globe,” as costs fall, technology improves: "The really big systems now have voltages of around 1.1 megavolts, they’re traversing 3,000km, (with a capacity of) 12GW — which is a third of the Australian peak demand — for a single (cable) ... with a loss of 10 per cent." 2017/01/17: The Economist: What is a Supergrid? High-voltage direct current cables could make renewable energy cheaper and more reliable. 2015/11/18: Updated Roadmap For The Energy Union. 2015/11/17: On achieving the 10 % electricity interconnection target – Making Europe’s electricity grid fit for 2020 (2015/2108(INI)). 2015/07/14: contracts awarded for world's longest interconnector: "The new interconnector will be the longest in the world, boasting 1,400MW of capacity, 730km of subsea high voltage direct current (HVDC) cables and a further 10km of onshore cables, although with twin cabling the total length of cable required will reach 1,450km. The link will run from Blyth in Northumberland on the UK side to Kvilldal in Rogaland on the Norwegian side and is scheduled to be operational by 2021." Transatlantic interconnection EU via Iceland and Greenland to Canada. Let’s Build a Global Power Grid: With a little DC wizardry and a lot of cash, we could swap power across continents. ELEXON: "The Balancing and Settlement Code Company". Power right now in the Danish grid, including interconnections. 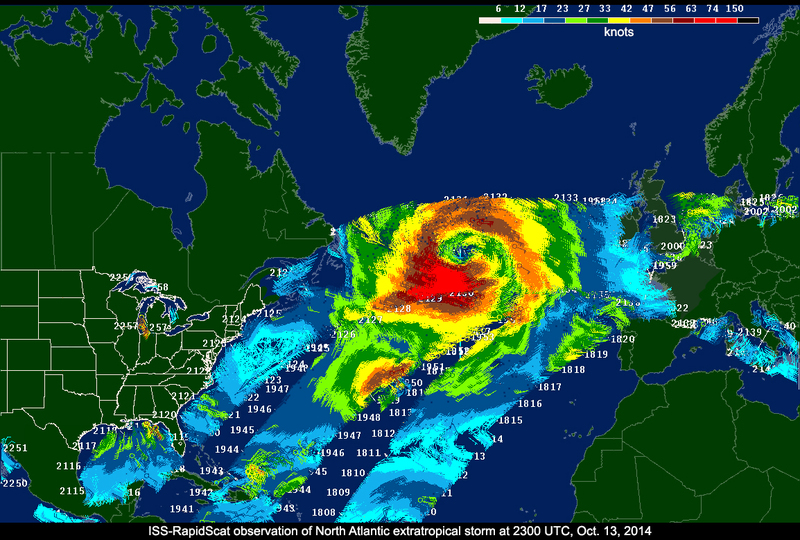 ISS-RapidScat data on a North Atlantic extratropical cyclone. First published 2017-08-23 , updated 2019-04-18 , rebuilt 2019-04-19 . Site copyright © 2007-2019 Damon Hart-Davis. Hosted by ExNet.